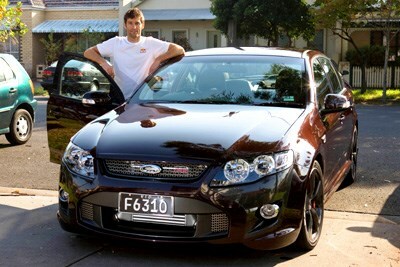 While in Melbourne for the season-opening Australian Grand Prix, Red Bull Racing's Mark Webber drove himself around town this Australian-built 310kW F6 FPV (Ford Performance Vehicles). Webber, who last drove a Ford when he was with the now defunct Jaguar team, reluctantly handed back the keys ton Tuesday morning before jetting off to KL for this weekend's Malaysian Grand Prix. "What a great car," he enthused. "The is what I miss in Europe... awesome Aussie muscle cars." Webber was almost certainly more comfortable in the borrowed F6 than he was in the Renault-powered Red Bull Racing F1 car on Sunday. Webber was clobbered by Rubens Barrichello's Brawn in the first corner and struggled with an aill-handling car for the rest of the 58-lap Australian Grand Prix.